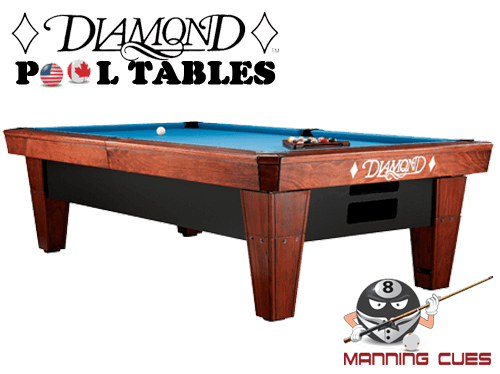 The Diamond Paragon table features the elegance of a home table with the legendary playability of a Diamond tournament table. 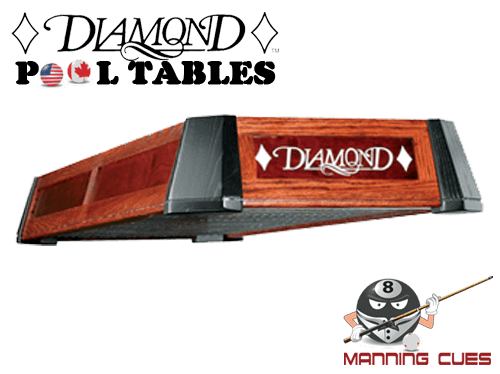 Constructed of Solid Hardwood Maple stained to suit your preference with Diamonds trade mark wedge leveling system keeps the 1" thick slate level and playing consistant. Bi-level leather top pocket design mounted flush to the rails keeps your hand flush with the rail tops when shooting close to the rail edge. 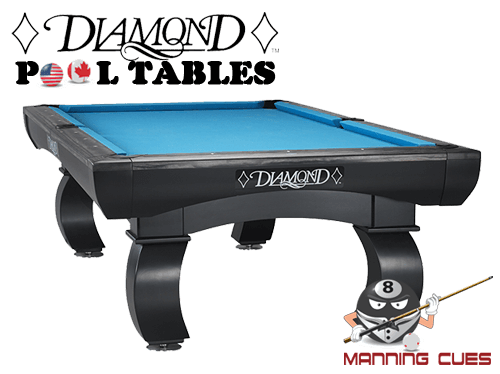 Top Rated Artemis Rubber rails and Simonis 860 HR felt will have your table playing at a pro level as you'd expect from a Diamond. "Honest, Genuine Reveiws & Pictures From Real Customers Below"
Due to the size of this item it is excluded from our Free Shipping Promotion. 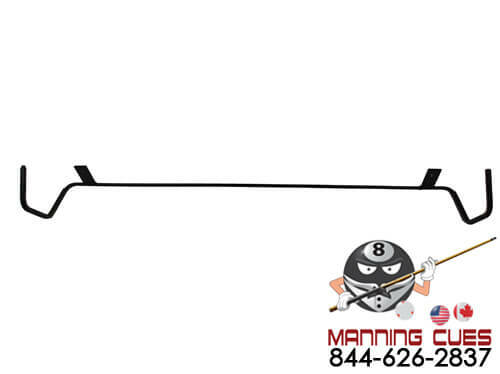 Installation and shipping costs for this product will be provided by Manning. 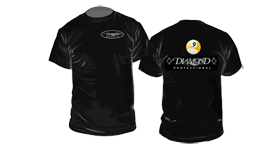 Diamond site colors are available in Black or White. Manning Recommends white sites with darker wood finishes and black sites with lighter wood finishes. This way you'll be able to see the Diamond Sites easily when aiming a bank or kick shot. The most important thing you need to know is that a one piece or three piece slate will play exactly the same if installed correctly. 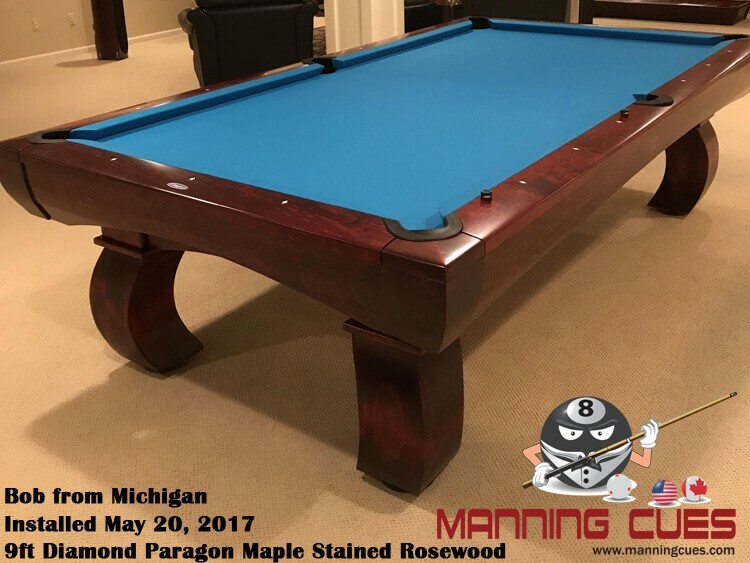 All tables purchased from Manning are installed by Diamond's Certified installers so your table will play exactly as it was designed. 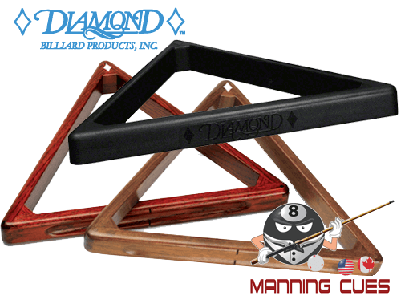 Don't chance you tables playability with an uncertified Diamond installer. 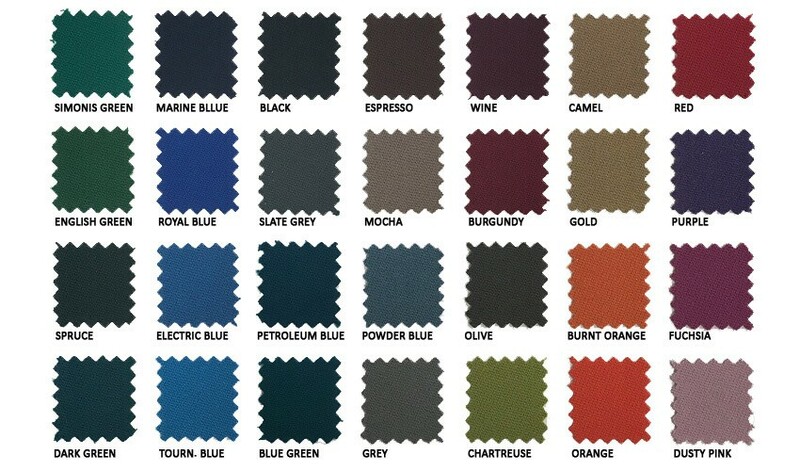 When deciding on a one or three piece slate table there are a few factors to consider. These factors will be discussed with you when you call Manning so you won't have any surprises or headaches! 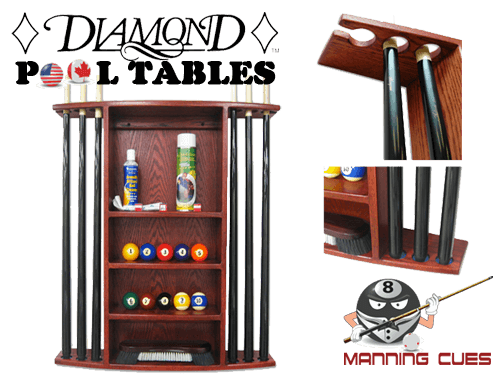 Diamond Ball Racks are available in solid Oak, Maple or Heavy Duty Black Polycarbonate (CR-1). The solid wood racks are available in your choice of Golden, Black, Walnut or Rosewood stain to perfectly match your tables finish. Other wood types are available upon request and subject to market price The commercial grade CR-1 racks are a replica of the hardwood racks but will look like new for a long time. They are ideal for bars and pool rooms. 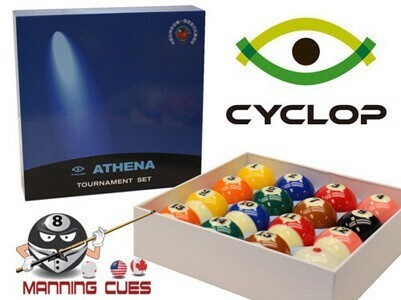 This Hyperion ball set includes 2 matching cue balls so when having a match you and your opponent can lag for the break. 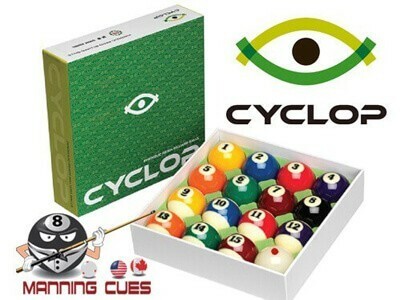 The cue ball has multiple dots and squares so the shooter can easily view the spin on the cue ball. Further, there are 3 extra object balls with oversized numbers and the Hyperion logo called the "Money Balls"! 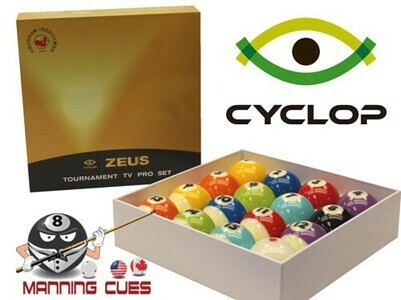 They are used for the final ball in each game of 8, 9 and 10 ball. Diamond table lights are available in 7' and 9' only with round or square corners. If you're looking for a light that projects light evenly over the whole table with no hot spots or shadows this it the light you want. The pictures below will show you each lights dimension, weight and installation height. All lights that have square corners will be finished with black corners as shown on the rosewood light below. 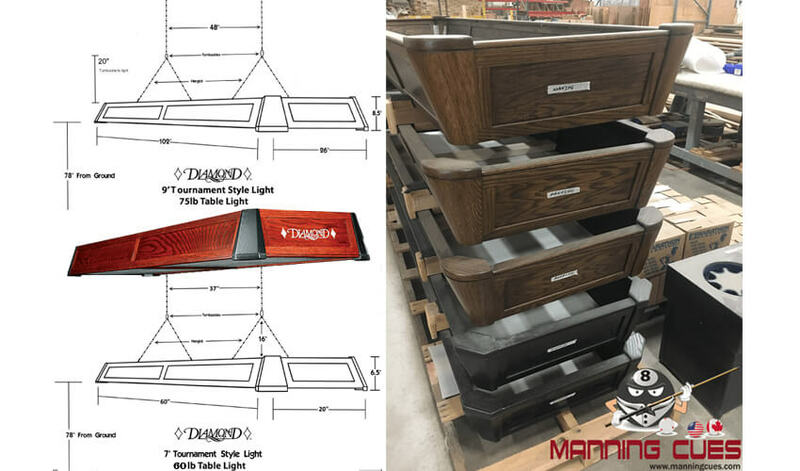 All lights with rounded corners will be stained to match the box of the light as shown in the walnut stain below. 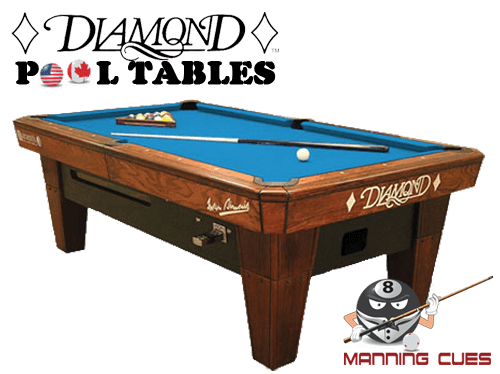 IMPORTANT: A Diamond pool table is wider and longer than any other table in the same size. 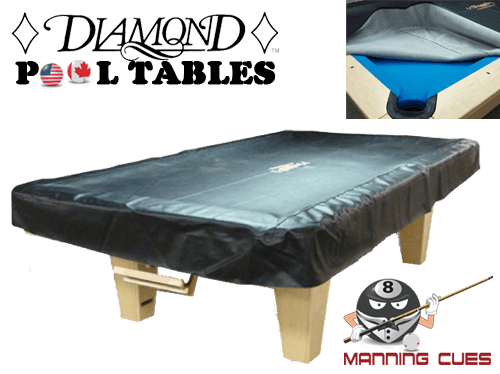 A Diamond tables top rail is on average 3-4" thicker so a no-name fitted table cover won't fit. An embroidered Diamond table cover is the perfect way to protect your table and is made to last as long as your table. 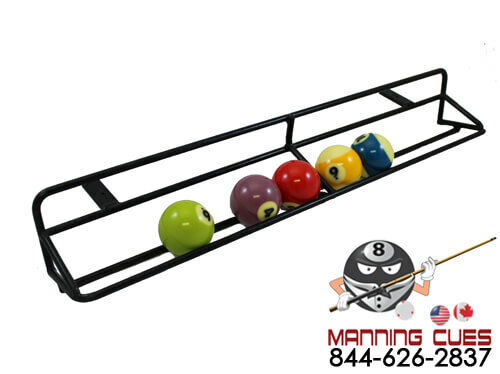 Shipping & Installation not included in base price - Please call Manning for a Quote. 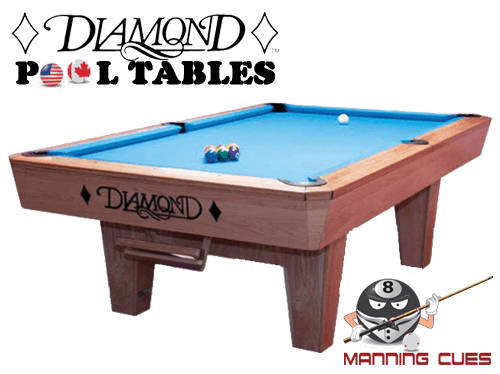 Diamond tables are manufactured in Jeffersonville, Indiana. If shipping the table across the boarder into Canada Duties and Brokerage will be extra. Light assembly, installation, and bulbs are the responsibility of the proprietor. I do not usually leave reviews (good or bad). I feel like I owe it to Heath to write about my experience. Hopefully this and the other reviews will help future customers feel more comfortable about dealing with Heath for all purchases; small or large. Heath kept in great contact during my order, build and delivery processes. Just before my table was ready to leave the factory, he was made aware of an issue with the aesthetic appearance. He quickly put a stop to scheduled delivery and then contacted me. He offered solutions and only after I made a decision, he made the change with production and scheduled delivery for my table. The table is flawless. Clearly Diamond and my two installers (a shout to Paul and Steve), need a ton of credit. However, a big reason that everything went smoothly was because of Heath. Heath added a lot of value to the whole experience and I am very glad I decided to place my order with him. 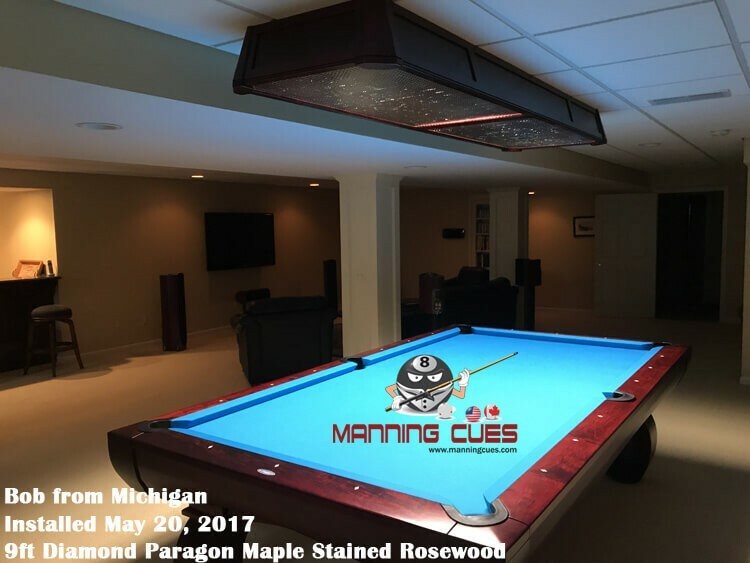 I ordered a Diamond Paragon table and matching light from Manning Cues which was installed May 20 by Gary Hume and Mike Veasey. 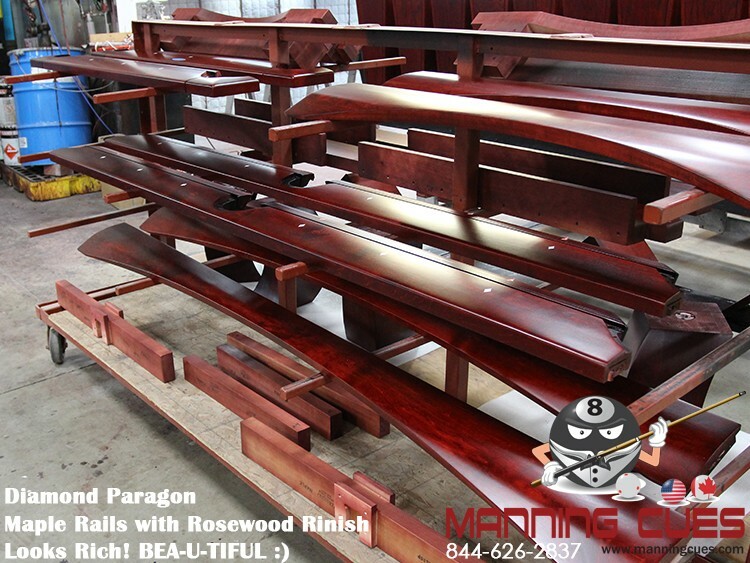 I am delighted with the table, light and the entire order to delivery process was handled well and professionally. Heath, Mike and Gary are highly experienced, knowledgeable and professional. 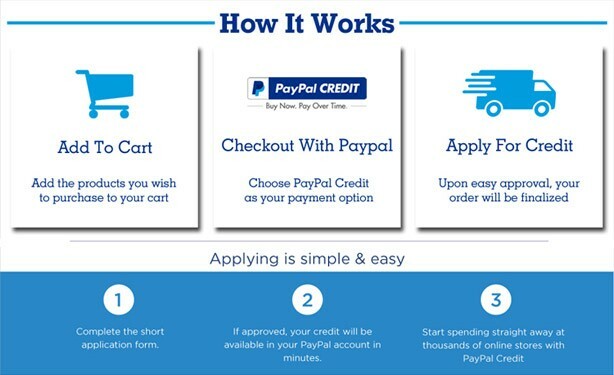 Advantages: Heath Manning takes a personal interest in his customers. His product knowledge is exceptional and if he does not know something, he says so and then gets the answer. The Diamond Paragon table was a major purchase and Heath answered my questions as well as the factory representatives. All communications were excellent. Another pool table mechanic who wanted to learn more about Diamond tables, observed the installation of my table. During the installation, Mike and Gary were very helpful in explaining the process and why they did what they did. It was interesting to listen to the mechanics share trade craft details. 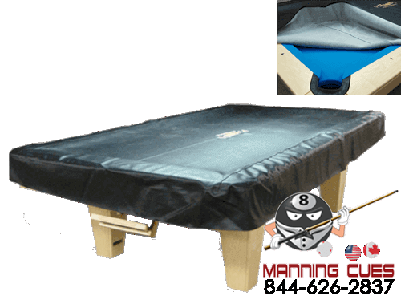 These guys work on major professional tournament and professional player's home tables. They know their stuff. The installation took 7 hours and it was always clear that their goal was to do the job right instead of getting it finished as quickly as possible. 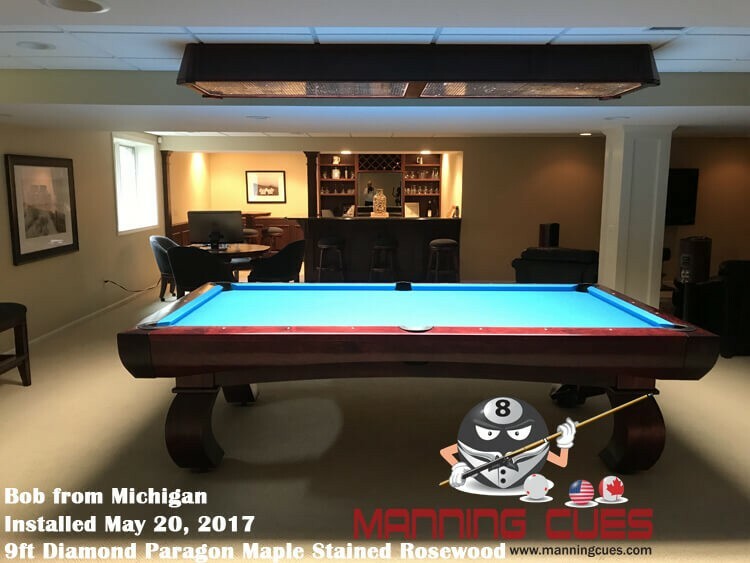 Disadvantages: Manning Cues is Diamond Billiards exclusive internet dealer. This was a concern initially, but Heath's knowledge and communication capabilities exceeded any I have had with established storefronts. I would have these guys back to work on my table any day. I consider myself lucky to have them install my table.